M�ody, utalentowany artysta - tak zazwyczaj rozpoczyna si� prezentacja gwiazdy wywiadu. Cz�sto s� to puste s�owa lub po prostu utarty wst�p, ale kiedy mowa o tym facecie, ka�de s�owo znaczy dok�adnie to, co wyra�a. Niemal ka�dy potrafi zanuci� motyw Free My Willy i niemal ka�dy zna charakterystyczne, mocne uderzenia Future Tomorrow, Stadium oraz oczywi�cie Kill of The Year. WeLoveTrance.pl prezentuje rozmow� z gwiazd� tegorocznego Sunrise Festival - Wezz Devall! Young, talented artist - this is how usually presentation of a star starts. Frequently those are only empty words or simply common introduction yet when we are talking about this guy every word means exactly what it should express. Almost everybody can hum motif of Free My Willy and almost everybody knows characteristic, strong beat of Future Tomorrow, Stadium and of course Kill of The Year. 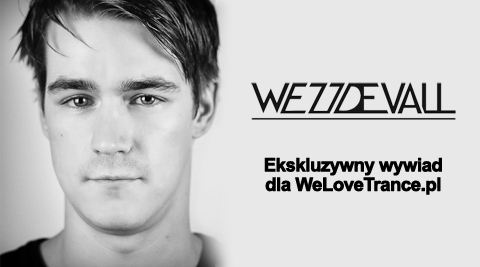 WeLoveTrance.pl presents the interview with one of this year Sunrise Festival stars - Wezz Devall!